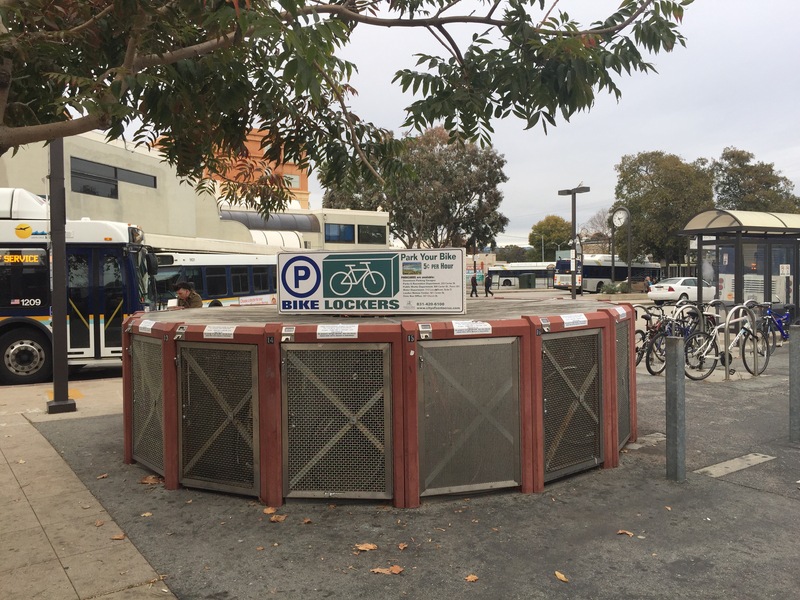 Continuing the theme of bicycles as a climate change solution, I recently explored what earned Santa Cruz a gold award in the League of American Bicyclists’ Bicycle Friendly Community program. Claire Fliesler, a city transportation planner, met me at a local coffee place and described the highlights. Of special note was the role of their local bicycle advocacy group, Bike Santa Cruz County, that did the lion’s share of compiling data and filling out the 16 page application. I’m used to seeing cities do their own applications for various projects and grants so this volunteer effort seemed pretty extraordinary to me. Way to go BSCC! In my trips to Santa Cruz I have long been impressed with the number of people biking but I had no idea that the rate of bicycle commute trips there is 9.5%, second only to Davis, CA. 30% of students bike to school. 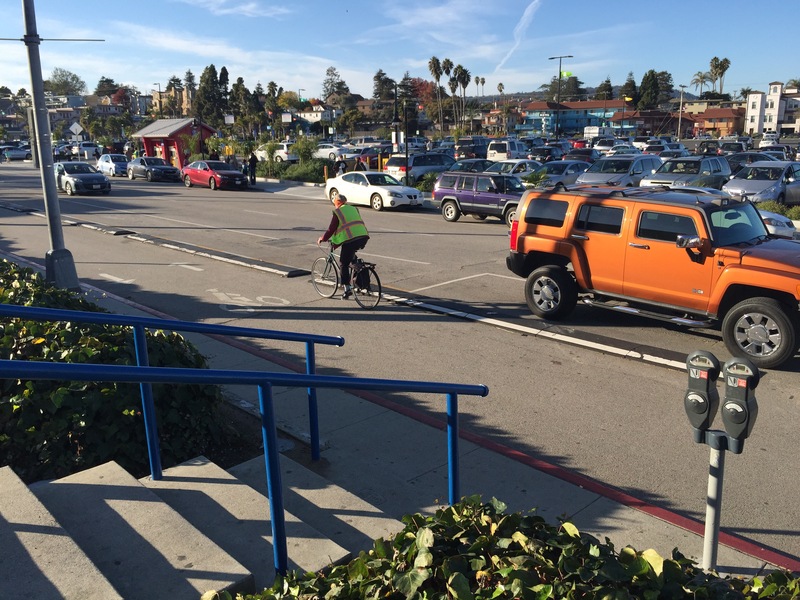 60% of Santa Cruz’s arterial streets have bike lanes, many the result of 4 lane to 3 lane road diet conversions. And 93% of their roads have a posted speed limit of 25mph. 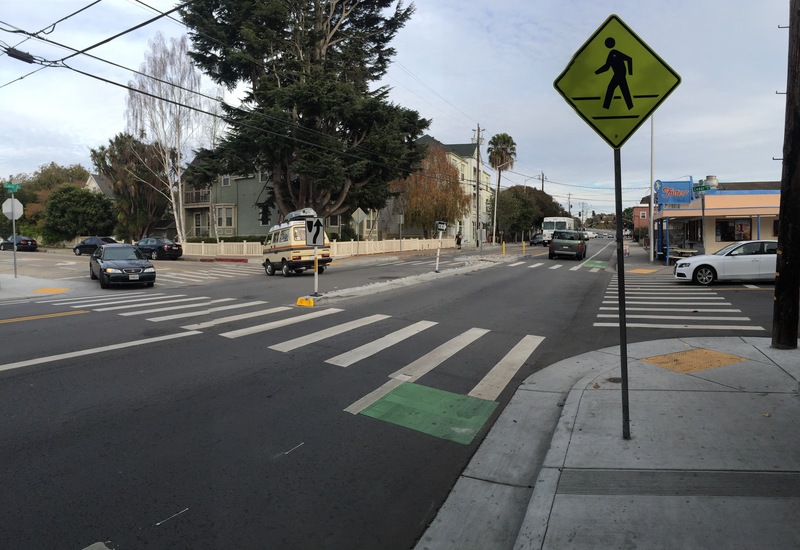 In recent years the city has built several major projects designed to provide connectivity across barriers. Most recently the Arana Gulch trail (above) with two associated bridges was constructed. 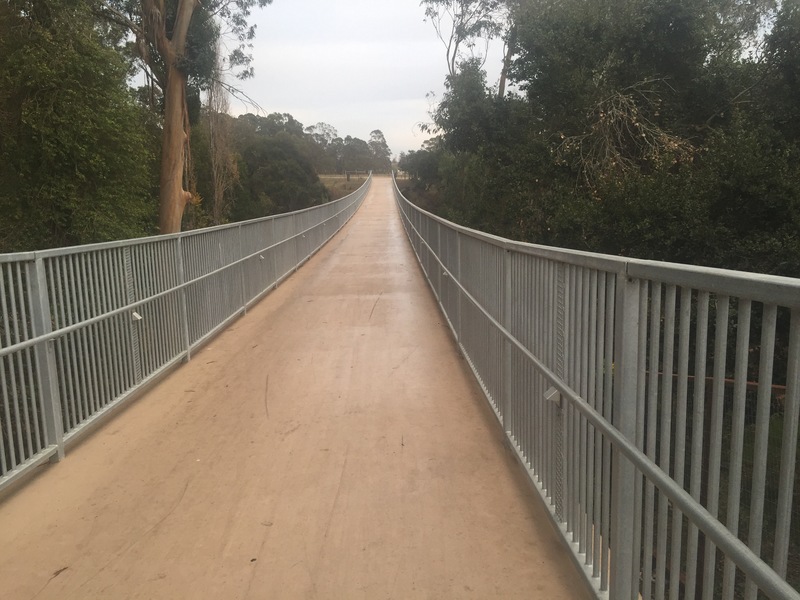 The trail provides an important east-west connection across a 68 acre greenbelt area, offering cyclists a tranquil crosstown alternative to busy Soquel Drive. Whether to build the facility or not was a long-running debate in the community. Some locals felt a trail would compromise the habitat value of the property. 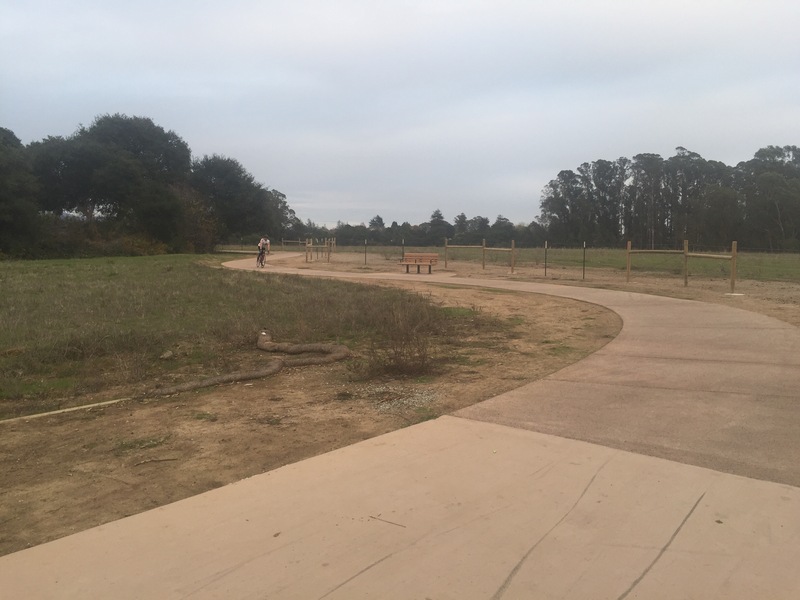 The project went through extensive review by the CA Coastal Commission who ultimately approved the $6.8mil project along with a program to help preserve the endangered Santa Cruz tarplant in this unique setting of coastal prairie. The Arana Gulch trail project includes some innovative features. 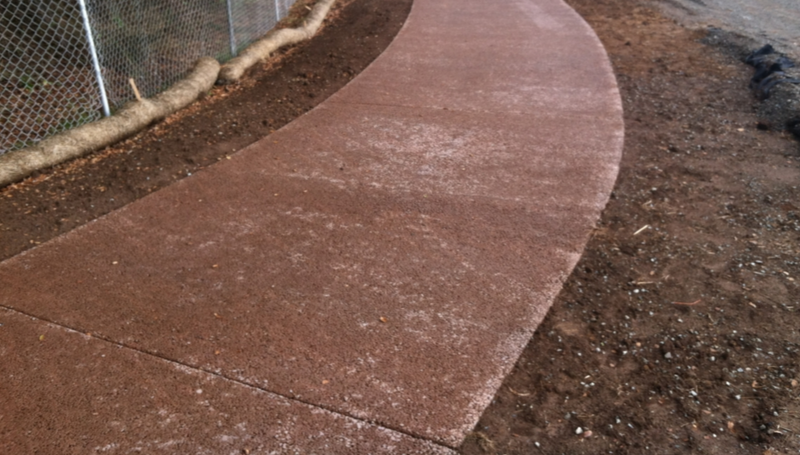 The trail itself is made of a porous, permeable concrete designed to minimize water pooling on the bikeway during wet weather. The Hagerman Gulch Bridge, below, was built using what’s known as a stressed-ribbon bridge design. 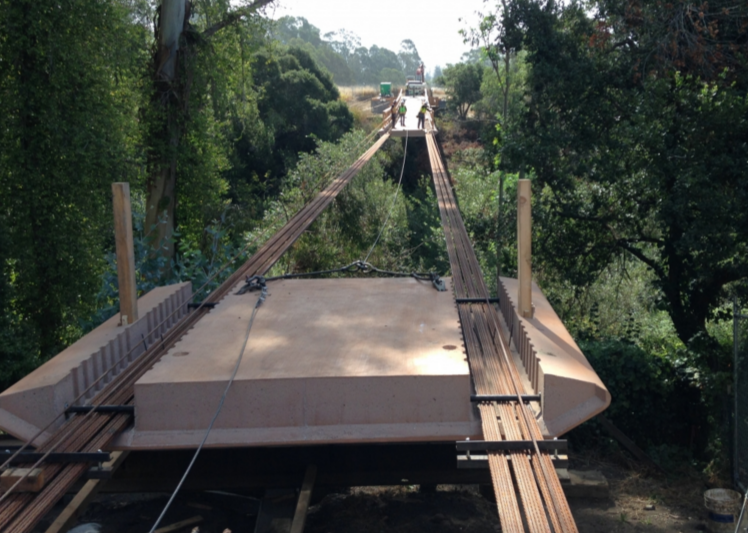 This construction technique uses two “ribbons” of heavy steel rope that are anchored on either side and precast concrete decking sections that are placed onto the ribbons by crane. The ribbons are tensioned, bringing the deck segments tightly together. 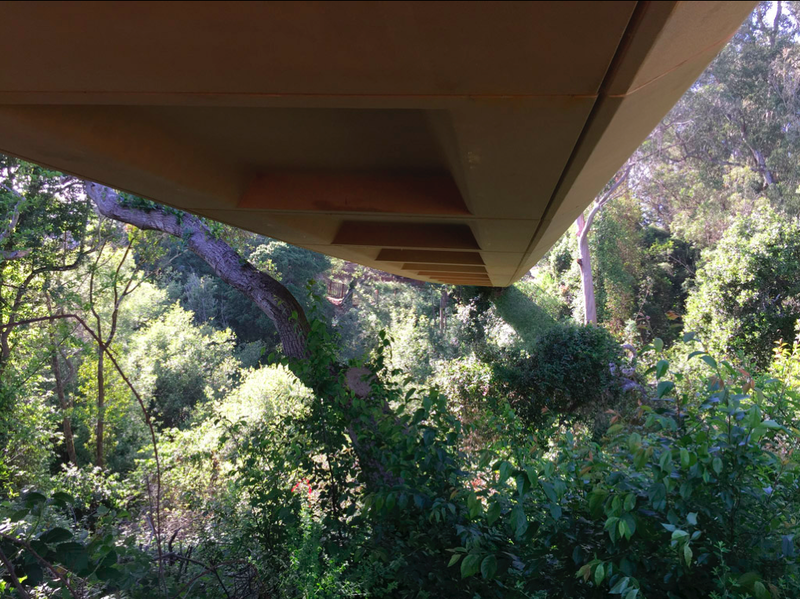 The joints are then grouted and railings added, resulting in a graceful catenary span sealed from the elements. Perhaps this would be a good bridge construction method for creating bikeways over some of our freeways in the LA area (I’m thinking of a replacement for the 7th St. bridge near Santa Monica High that was removed when Caltrans widened the freeway there). Above is the Felker Street Bridge, a steel truss type bike and pedestrian bridge that connects a dense multi-family neighborhood with the River Street commercial corridor. 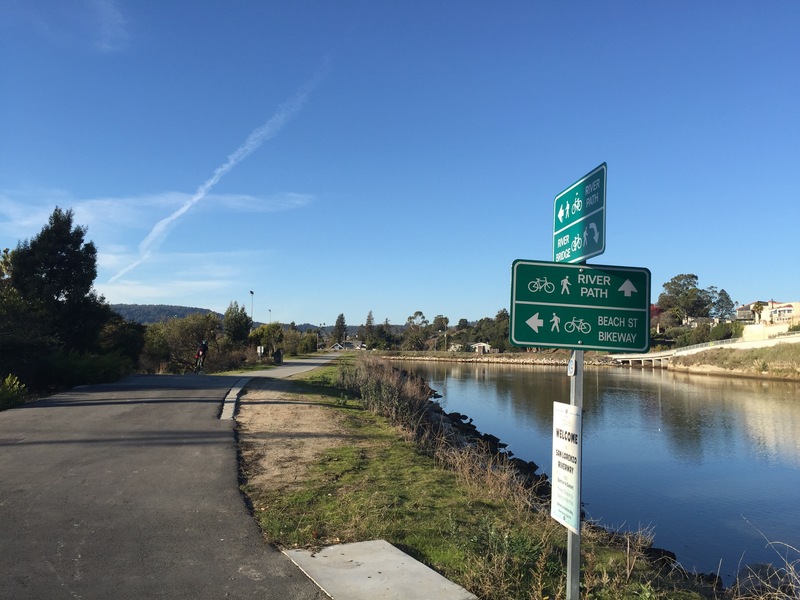 It spans the San Lorenzo River providing a valuable bike-ped crossing where the only other one is about a half mile away. 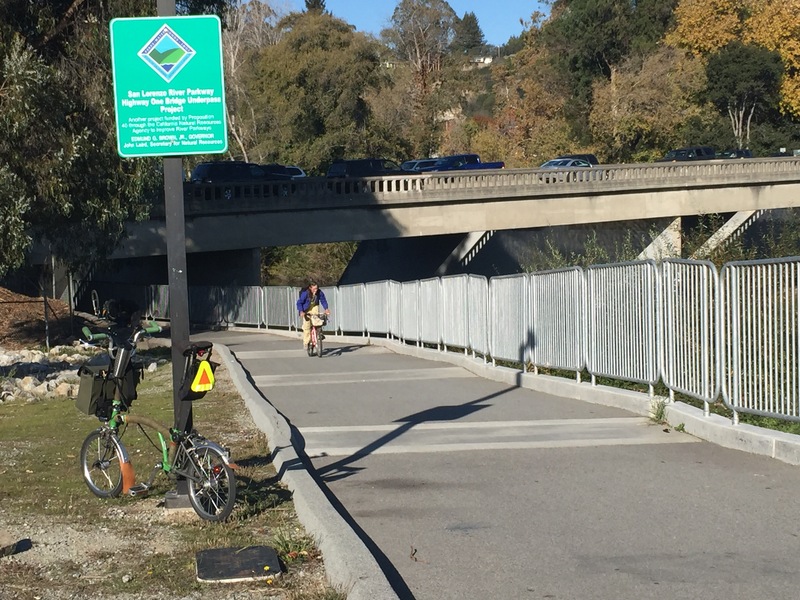 Adjacent to the Felker St. bridge is the Highway One Underpass, above, which extends the San Lorenzo River trail under this busy freeway. 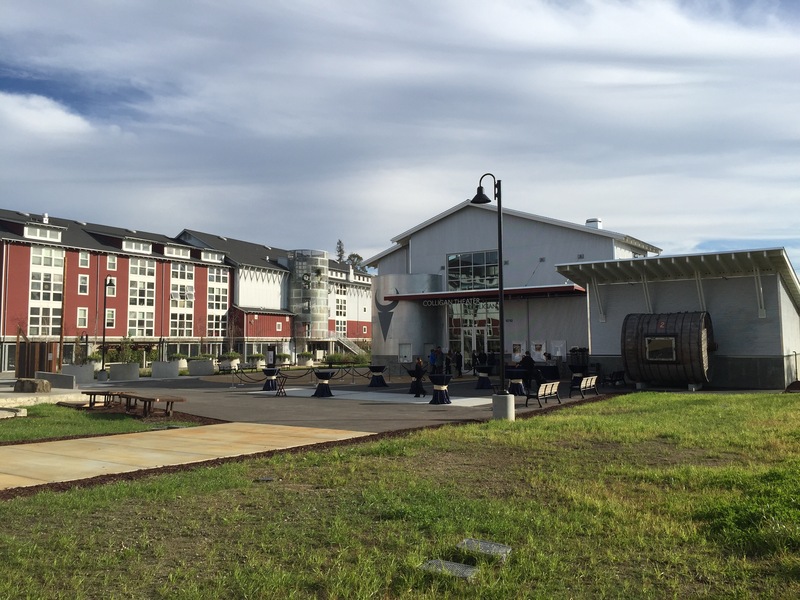 The river trail connects to the downtown area in one direction and provides a non-motorized connection to the recently built Tannery Arts Center in the other. The arts center has 100 affordable live-work units for artists, studios, galleries, a cafe and performance spaces (below). 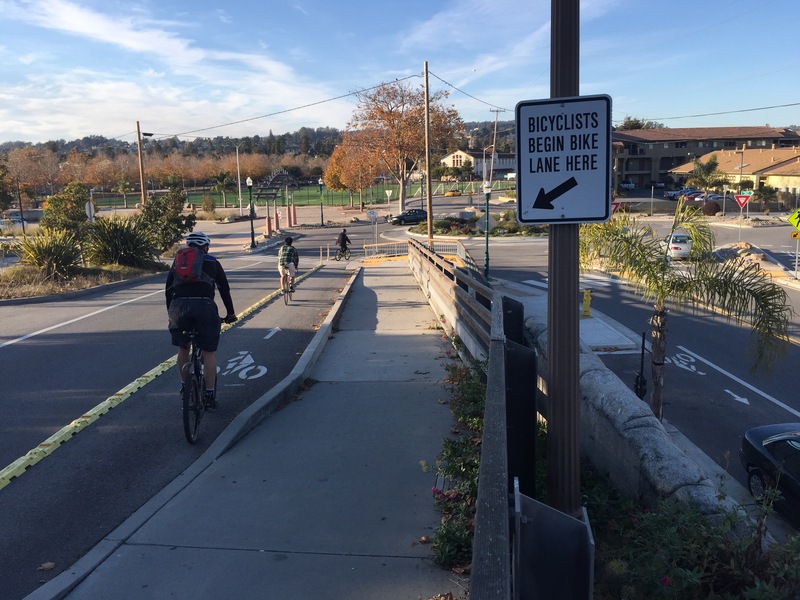 A cantilever bikeway was added to this bridge, above, and well-marked routing on the other side offer a creative solution to a tricky transition, below. 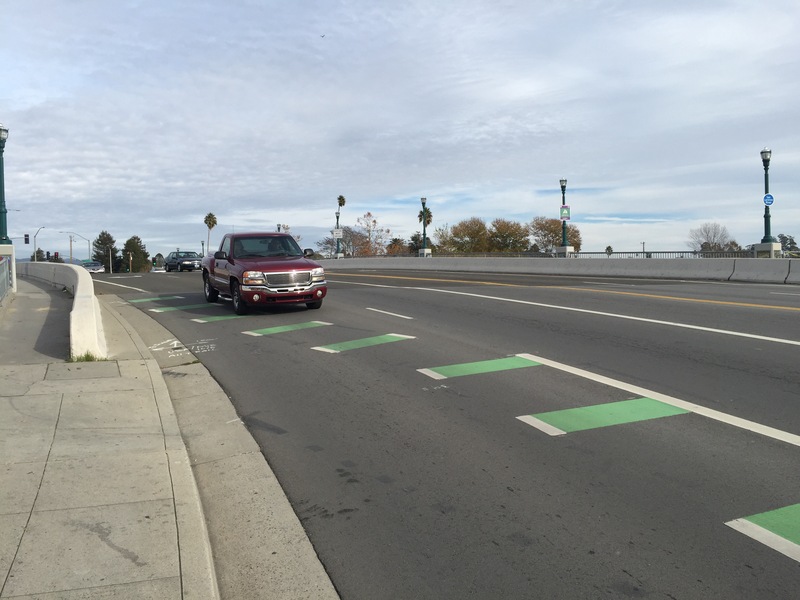 Buffered bike lanes have been installed on some streets, above. Note how the generous parking lane provides room for trash bins so they don’t encroach into the bike lane. 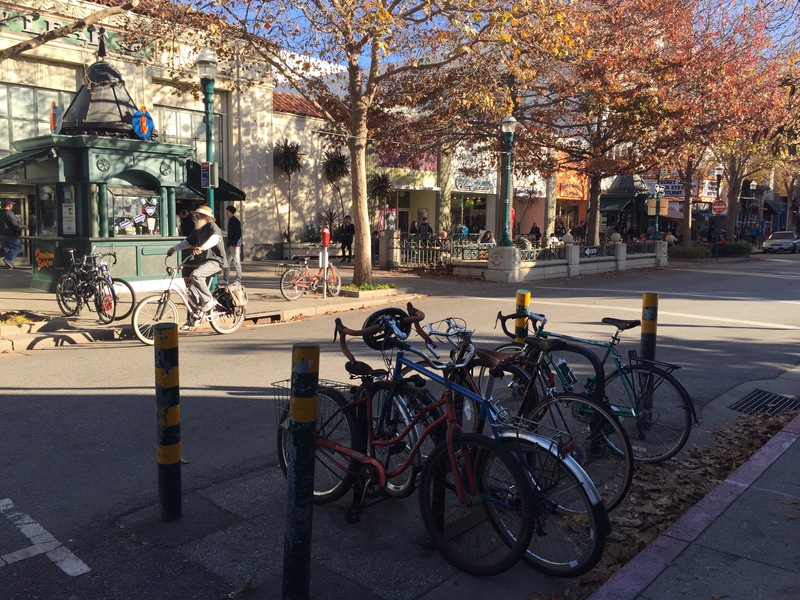 Downtown Santa Cruz is very bike and pedestrian friendly with low speed streets, lots of destinations and plenty of bike parking, including bike corrals. 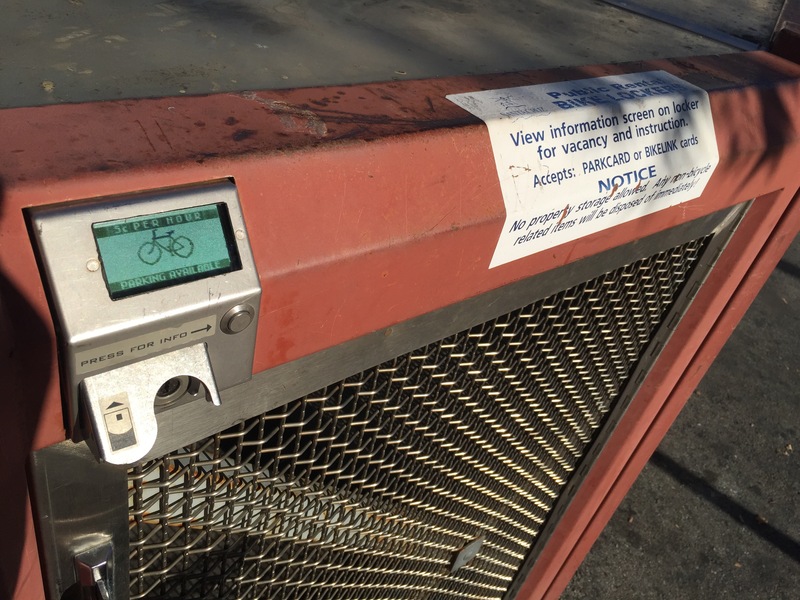 100 bike lockers, accessed with a smart card, are available on a first-come-first-serve basis for 5 cents an hour. The lockers below are located next to the city’s Metro Center where numerous bus lines converge. 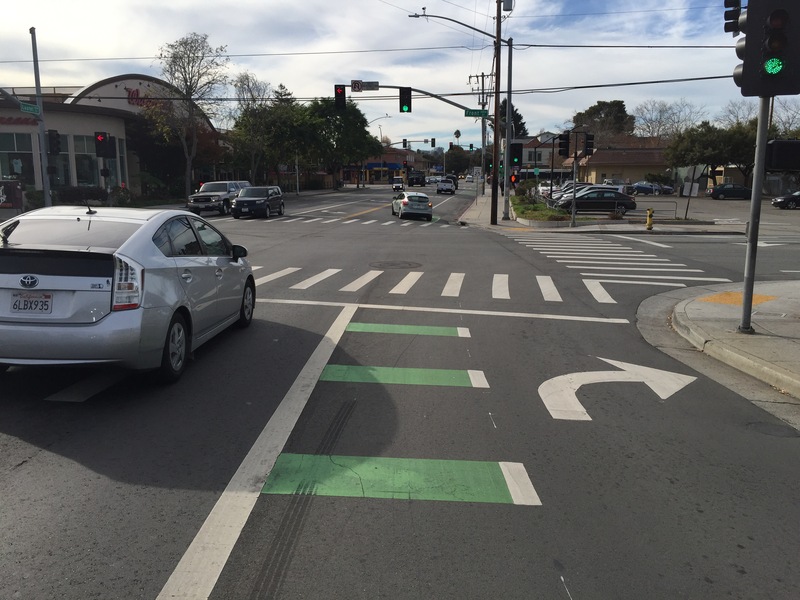 Green pigmented bike lanes are being installed, particularly at conflict points like those seen below (the rail crossing seen here is part of the line under study mentioned further below). 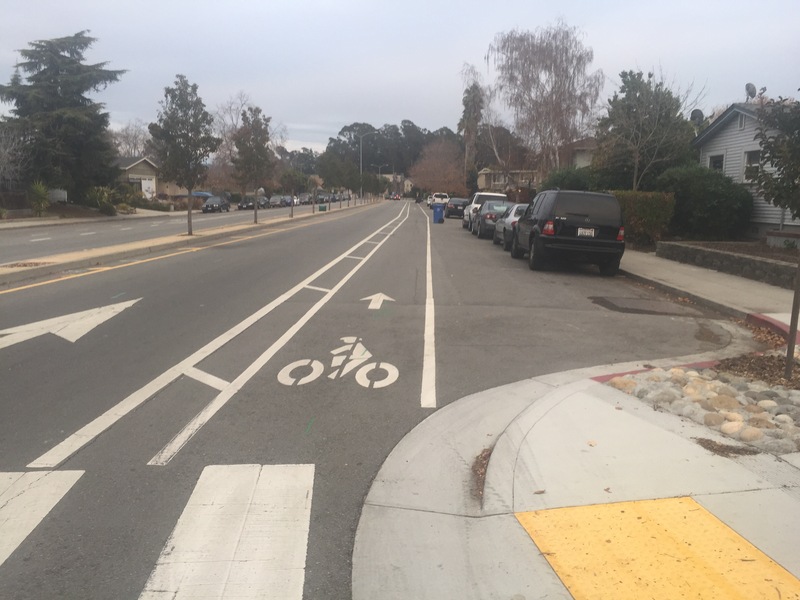 Contra-flow bike lanes have been installed on some one-way streets. Those seen below are on Beach Street next to the popular Boardwalk amusement park. 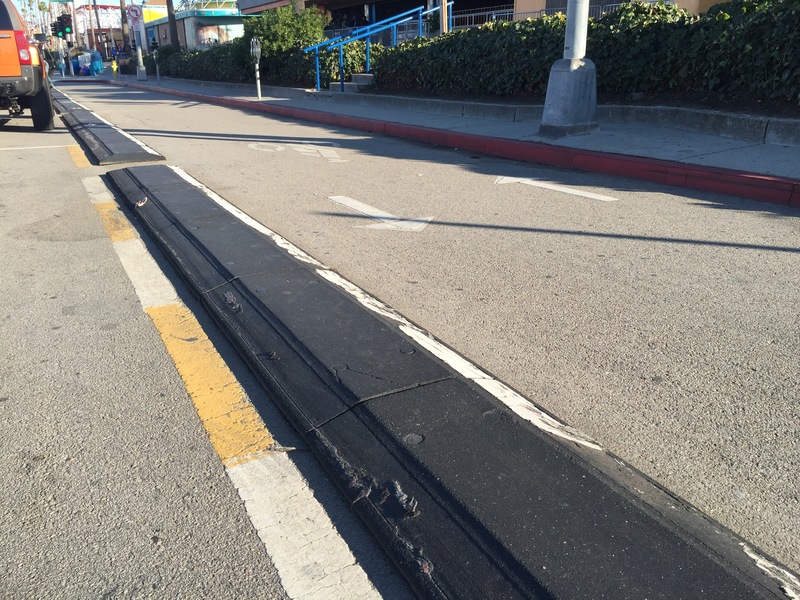 Rubber curbs create separation between traffic lanes and the bi-directional bikeway. Thirty intersections in the city use inductive loops like those below to detect cyclists and 10 intersection have video detection. Sometimes it is a bit of a mystery to know how to get a signal to respond when you are on a bike. 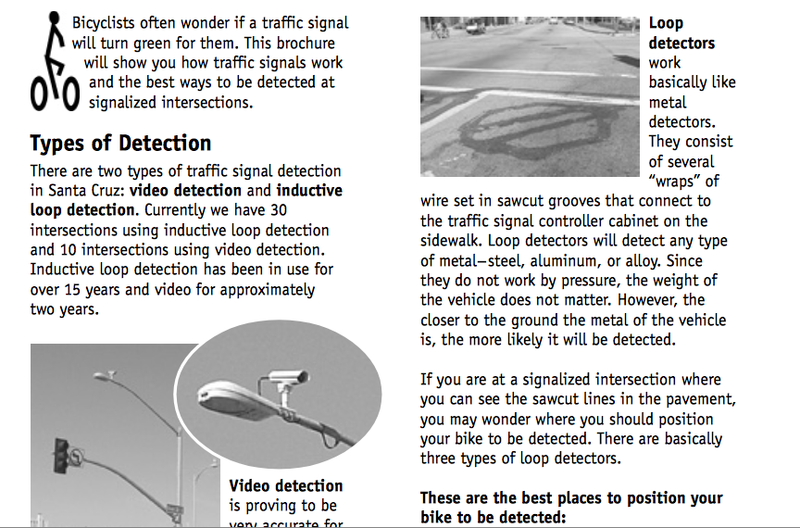 So the city publishes a useful brochure to help cyclists understand where to position themselves to be detected. Very thoughtful; I like that! Santa Cruz’s education programs also contribute to the city’s gold status. 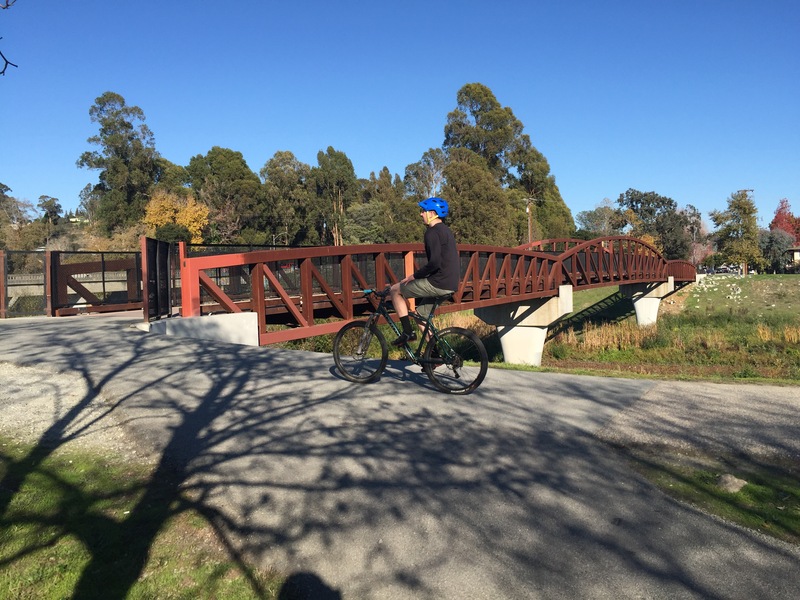 Green Ways to School (a program of Bike Santa Cruz County) provides school-based cycling instruction as well as their popular Bike the Bay youth ride that has introduced many young people to cycling. Bike Smart (run by Ecology Action) also provides in-school education, skills courses and rides. Santa Cruz schools also hold annual Bike and Walk to Schools days. Seven schools also hold these events on a monthly basis resulting in significant increases in biking and walking to these campuses throughout the year. Three schools are using RFID tags worn by kids biking and walking which log their trips when they arrive at school. For enforcement the city not only targets speeding motorists but has a ticket diversion program for cyclists cited for moving violations. Offenders can take a bike safety course in lieu of paying a fine. 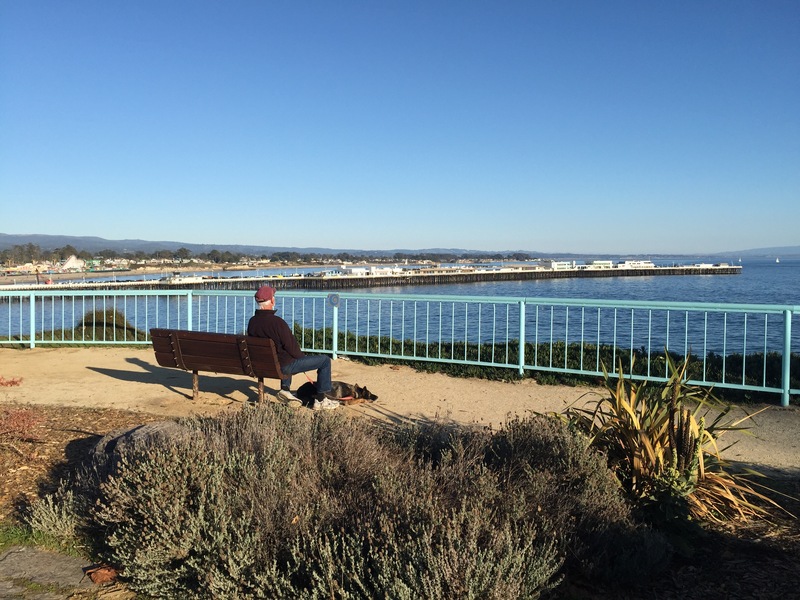 Looking to the future, Santa Cruz County and the city are participating in planning for the 50 mile Monterey Bay Scenic Trail, 32 miles of which will utilize a rail corridor now owned by the county for a rail-with-trail. Over $20 mil in public and private funds have been secured to build four segments of the trail, or 8 miles. Construction is to begin soon as design, engineering and permitting are completed. This same 32-mile corridor is part of a longer-range vision for a regional passenger rail line that will roughly parallel Highway 1 in the area. The concept is the subject of a rail transit study underway including surveying the public about their needs and preferences. 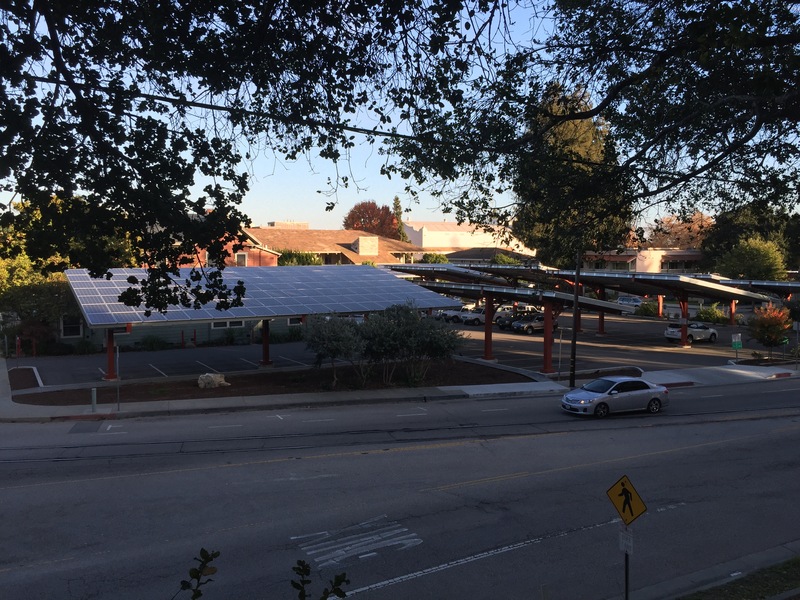 – 7 large municipal solar projects generating 1,200,000kWh of electricity (as of 2014). 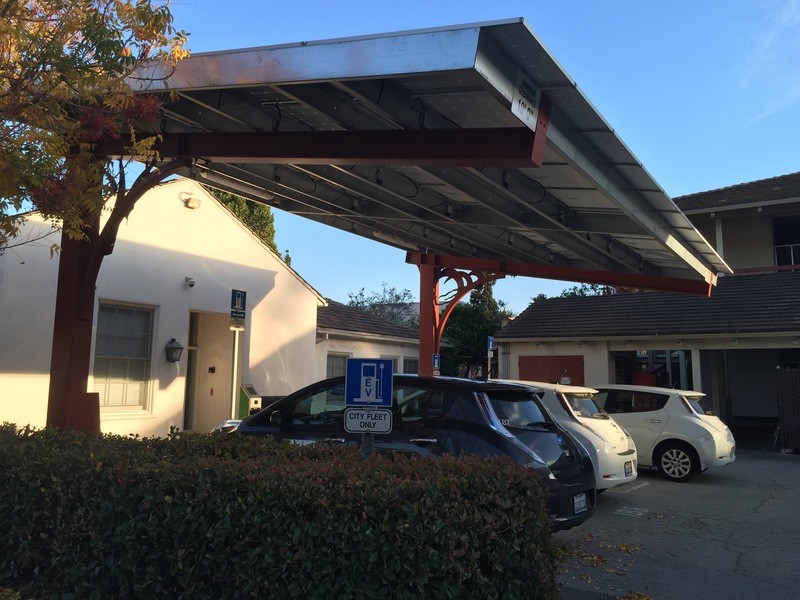 – Over 1000 solar installations throughout the city and growing. 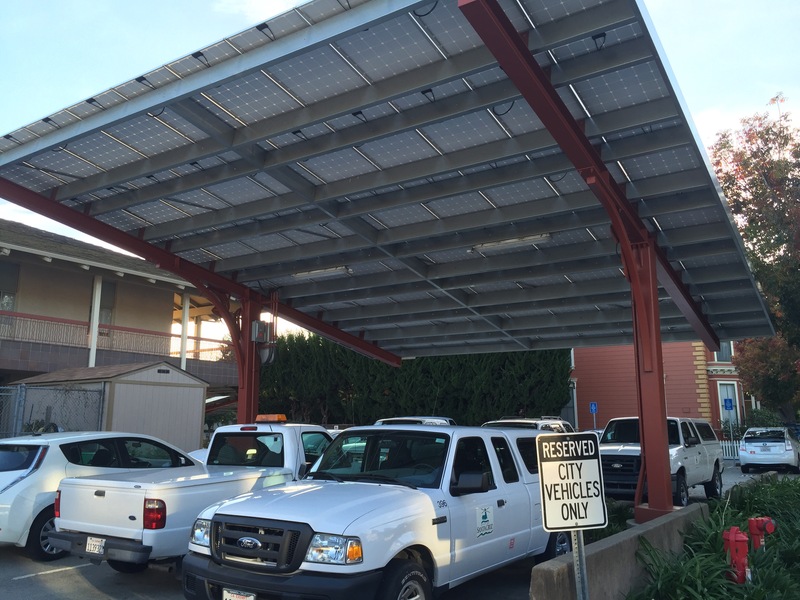 The city provides technical assistance and is piloting a streamlined permitting process. – The EnergySage solar marketplace assists residents and businesses finding and comparing pre-screened installers and identifying rebates. – Energy efficiency programs, such as LED street lights, have cut municipal energy use 40%. 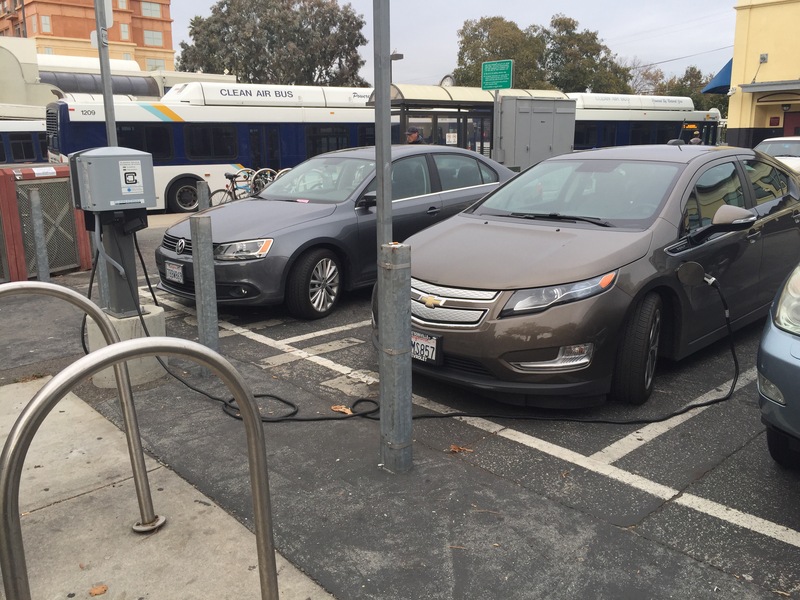 – Expanding the city’s zero-emission vehicle fleet (10 vehicles now) and installing EV charge stations. – Promoting the city’s Green Building program, which has 76 award-level projects around the city. – Promoting the city’s Green Business program, now with 125 certified green businesses. – Car sharing. 9 Zipcars are available in the city. – And of course, expanding the use of bicycles and transit. Santa Cruz is doing a lot of wonderful, forward-looking climate solution stuff but I would be remiss not to mention another important climate change-related campaign in the city. 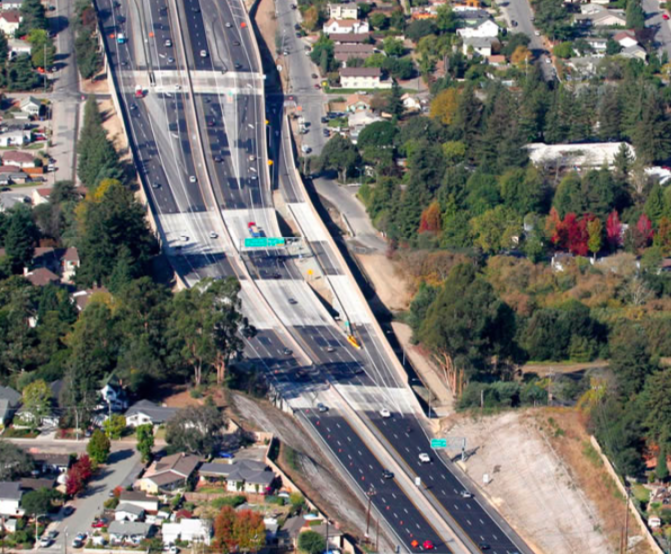 Unfortunately, Hwy 1 is in the middle of an ongoing widening project, expanding it from 4 lanes to 6 with extensive merge lanes making it even wider. This really makes my heart sink. Haven’t we learned the futility of adding more capacity to an obsolete transportation paradigm? Judging from the plethora of widening projects we’ve had in LA, the only changes that I’ve seen them bring are more cars dumped onto our surface streets, more fuel burned, no improvements in congestion and huge sums of money squandered. Sorry to end this post on a down note but we really need to learn from our mistakes and stop digging ourselves in deeper. Our country just set ambitious goals in Paris to drastically cut our CO2 emissions. To stand any hope of meeting those targets we need to divert funding from the highway engineering-industrial complex* and put these folks to work on projects that prepare us for the future! 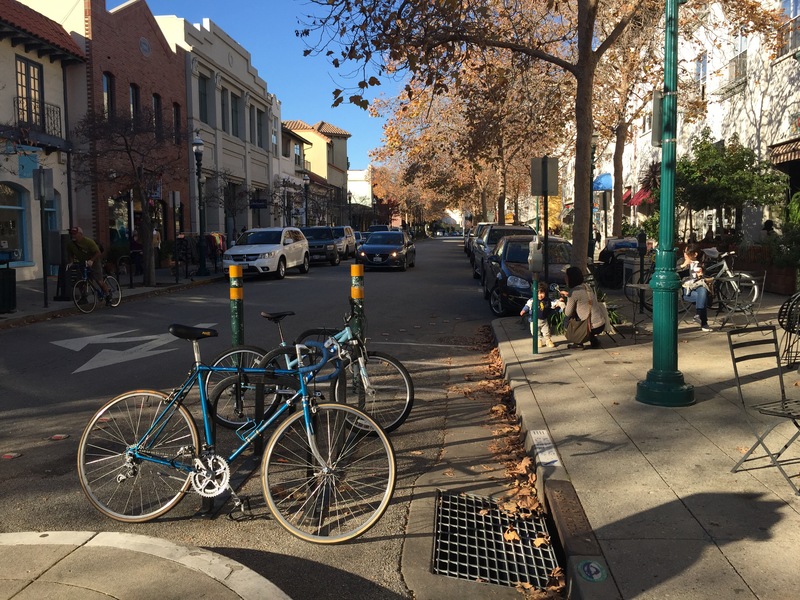 For more info about Santa Cruz’s bicycle programs, check here. 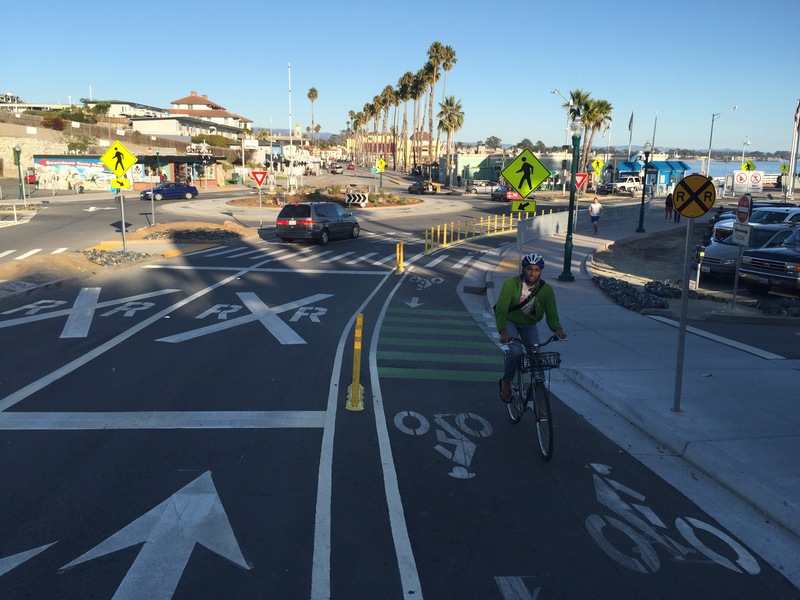 Below are more images of Santa Cruz’s bikeway infrastructure. 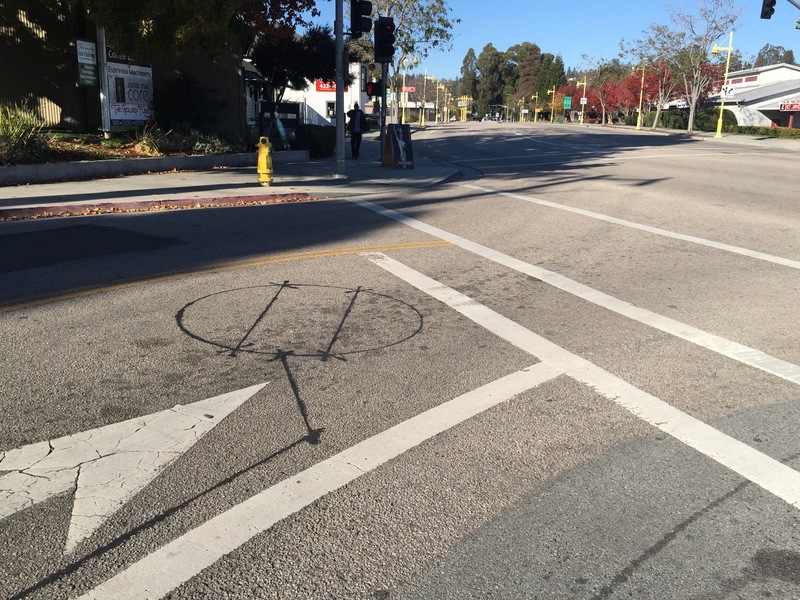 Traffic diverter that prevents motor vehicle through traffic. 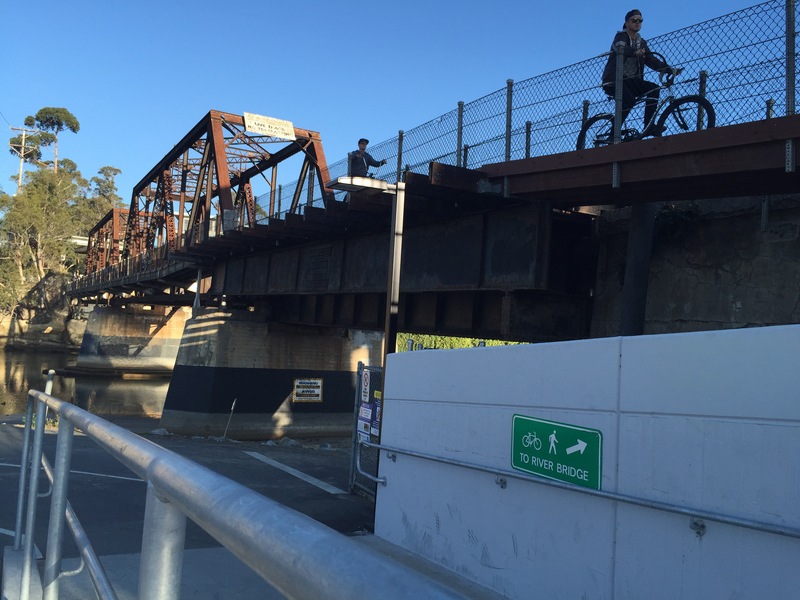 New access ramp to multi-use path on rail bridge over San Lorenzo River. 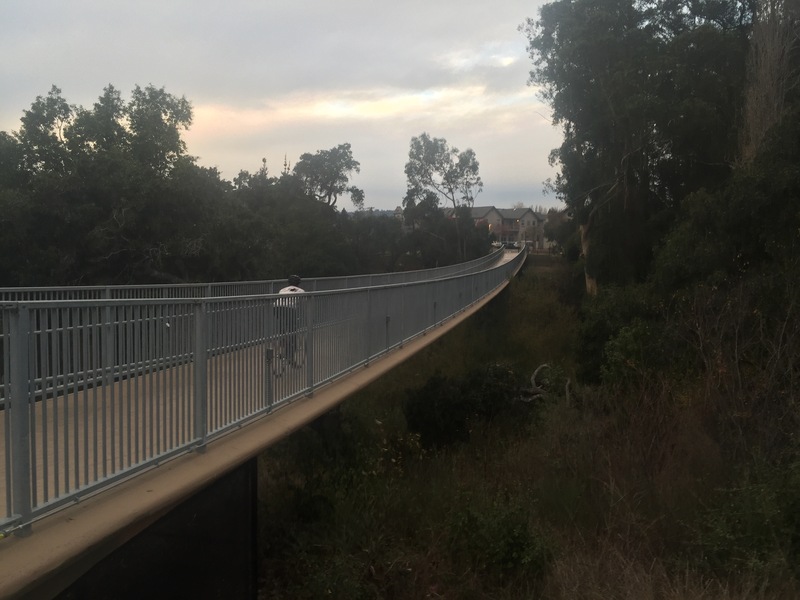 Yes, we in Santa Monica could definitely use a few stressed-ribbon bike bridges across the Santa Monica freeway: at 7th Street and at 20th Street. 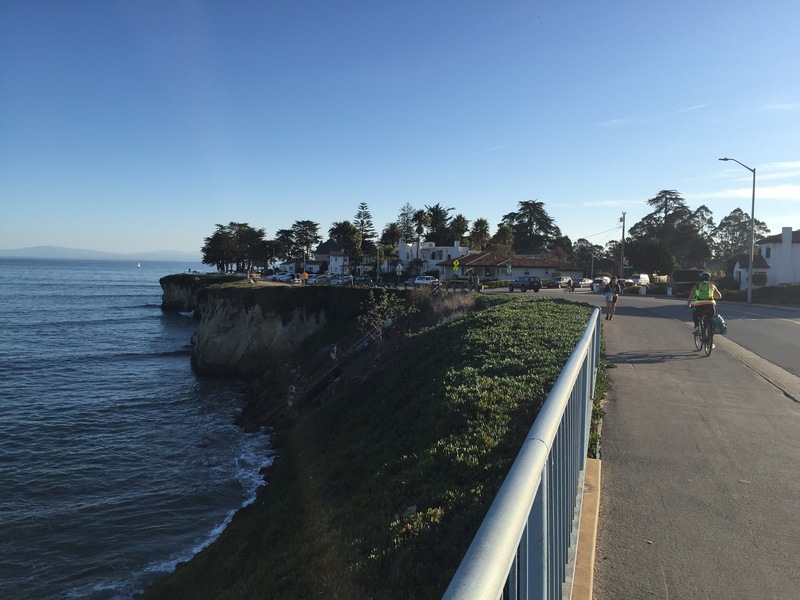 Santa Cruz has committed more energy and money to advance bicycling than Southern California cities. Very inspiring. Very nice reporting, Kent. Excellent analysis of engineering and policy for this small, very progressive community. It’s size and politics along with the UC campus certainly helped them get Gold designation. It’s obviously much more difficult for big metros to get there. I’m pleased to report that Henderson, NV my city is now Silver and is working toward Gold. Keep up the good work! Great pictures and great information!!! C y. Thanks for that, Kent. Nicely laid-out article, from which other communities can pick and choose pieces that might suit their own topography and/or population. The photos are extremely helpful. 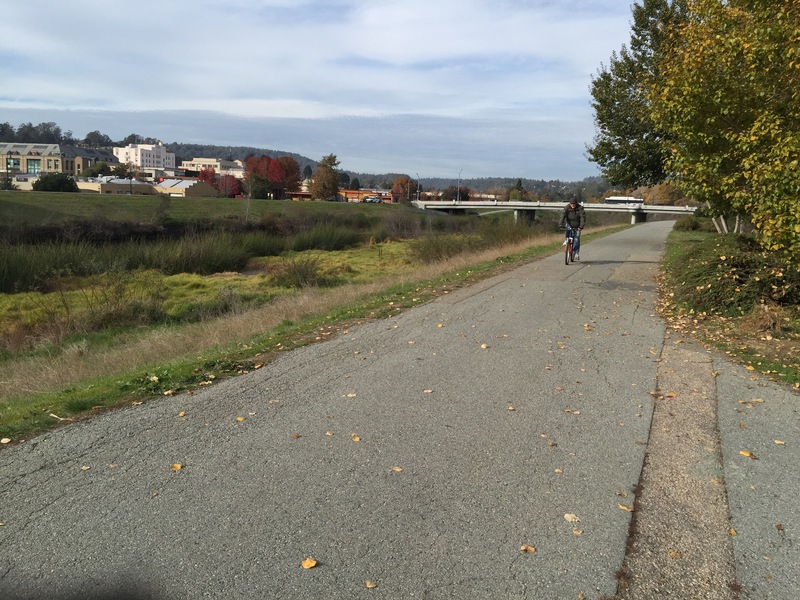 Wondering if the bike trails and lanes are always as empty as depicted… Thanks for great reporting and happy trails! Kent, your journey, your reporting, and your commitment are all very inspiring to me. oh yeah: and great photos!!! It’s so wonderful to see so many improvements in my old college town! I am familiar with many of the programs like the after school bike program where I volunteered with the incredible coordinator and friend Tawn Kennedy, I even got to utilize the bike education class after I got a moving violation. Oops! Thanks for sharing Kent! Ah, Cuba! I’d love to bike there myself someday. There’s also Adventure Cycling, https://www.adventurecycling.org. They are a good resource for touring cyclists as well. Their print magazine has a Companions Wanted section. I couldn’t find this on their website, so you’d have to become a member to run an add, which is probably free once you join. Also, Ron Milam did a bike tour / honeymoon in Cuba 10-15 years ago. You might want to pick his brain; I can’t imagine that things have changed too much there over the years! Finally, I did a search on “cycling in cuba” and a bunch of organized tour outfits came up. Tho it would cost more than DIY, this might be a good way to do it as tour guides usually suss out good accommodations, food, logistics, etc. If the style and itinerary of the tour suits your tastes, that is. It looked like there was other info onlne about bike touring in Cuba.